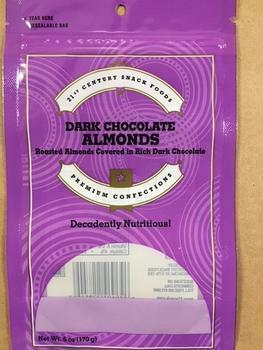 21st Century Snack Foods of Ronkonkoma N.Y., is recalling Dark Chocolate Almonds containing milk, an allergen not declared on the label. The recalled product is packaged in a 6-oz. plastic hanging/stand-up bag with the UPC# 030603 228549 and lot numbers 16100 thru 17300, and was sold in retail stores nationwide. Customers who purchased the recalled should dispose of it and contact the company by email at centurysnack@gmail.com for a full refund. Consumers with questions may contact recall coordinator Michael Bell at 631-588-8000 from 9:30 am – 3:30 pm.